Reaction: After the taxation phase begins, place 1 gold from your gold pool on Lannisport Treasury. 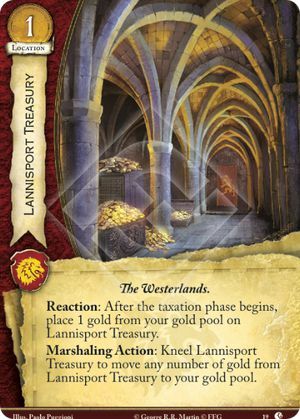 Marshaling Action: Kneel Lannisport Treasury to move any number of gold from Lannisport Treasury to your gold pool. Lions of Casterly Rock #19.